Remember when we read Victoria Hislop’s ‘The Island’? That haunting story full of love, life and death had us spell bound. Spinalonga offers all those feelings and more, but the story starts for us at Agia Nikolas, where we thought we would sail to Spinalonga and anchor there over night. Before we could depart, the wind started gusting fiercely. We went to plan B and left Mercier in the marina and took a day tripper boat over to visit the Venetian Fortress and former leper colony of Spinalonga. While the Ostria left the harbour, James second guessed himself and thought perhaps we should be sailing but then we turned the corner and saw what force 7 wind looks like. Just hazard a guess, much better from a large tripper boat than our small yacht. 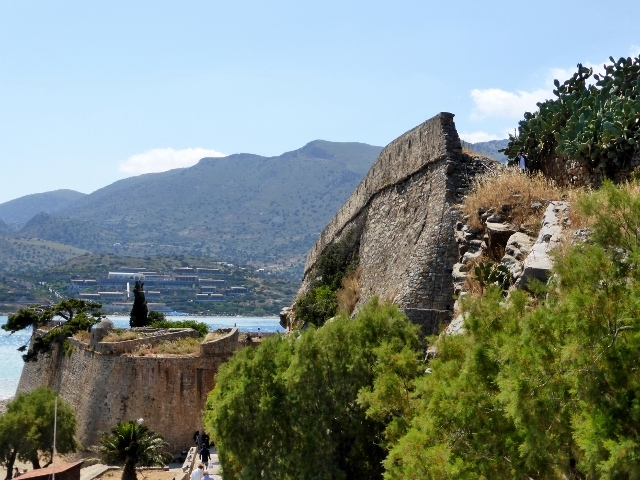 As you approach Spinalonga, you can see that the Venetians were here circa 16th Century and built a fortress, which managed to keep the Ottoman Empire at bay for over 70 years after Crete had been under Ottoman rule. Finally the Venetians left and Turkish families found the island a safe haven. When Crete regained autonomy in 1898, they asked the Turkish families to leave and after several discussions, in 1903 the Cretan strategy seemed to be, Spinalonga will become a Leper colony. The Turkish families departed. 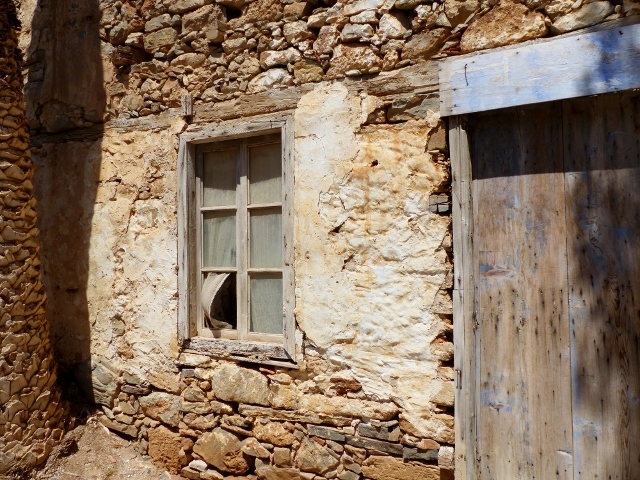 According to the guide, the Cretan lepers initially lived in caves on the island and then moved into the Turkish homes. As people across the economic spectrum came down with leprosy, so it was not long before one could find several tavernas, a hairdresser, teachers, doctors and priests on the island. 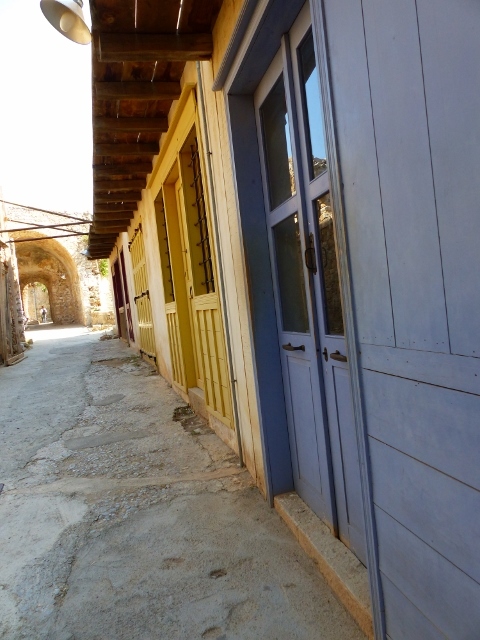 The Walk, this was the area of shops, tavernas and markets. They began their own gardens and food production and while they were bereft at leaving their families, Spinalonga became a refuge against the ignorance and hate people had experienced in their former homes. It was interesting to note that the Germans invaded Crete, but they never broached Spinalonga. The rocky island is harshly beautiful and with all the wind, it seemed spooky at times because the old curtains were blowing in the breeze. 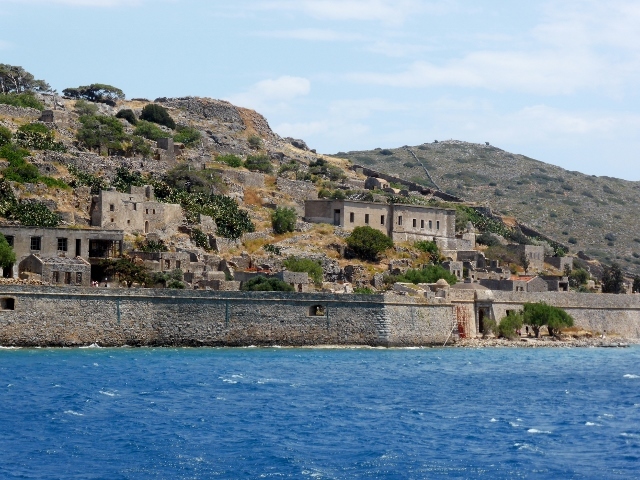 You could almost hear a tinkle of a leper’s bell, but the 1948 cure meant that Spinalonga was vacated in 1958. The curtain blowing out the window added to the haunted feeling.